A wheely good evening from Paul Ashman Cycling. I hope you’re all enjoying the increase in temperature and getting out on your bikes more, I certainly am and even nicer to be a bit warmer on the playgrounds of Swindon schools. Apologies for the lack of blogging recently, I blame it on bikes, cycling and out training too much! This blog is an update on the current schools work and also about the inaugural Paul Ashman Cycling Easter holiday camp. The Swindon schools that I am working in are taking on the cycling at an alarming rate and more and more children are on bikes and enjoying the sense of two wheels and the fresh air more and more. Recently I have been busy expanding into new areas and in particular within the White Horse Federation including soon to be visiting schools across the county. Things are certainly expanding at a phenomenal rate and it is great to have Jennifer Purcell on board to help deliver the projects. Currently we see nearly 700 children a week and this will only increase. As I always say get more kids on bikes and let’s see more riders out on the roads. Only too often I see adults not riding or out enjoying cycling and I firmly believe this stems from grass roots level so my mission is get that sorted and we will have so many more out cycling the Swindon cycle paths and roads. Let’s aim for less car use and more bike use. If you have any questions or enquiries around Cycling in schools please get in touch. As you can see from the poster we have the first Paul Ashman Cycling holiday camp coming up in a few weeks time. There are just a few places left so please get in touch if you want to sign your child up. The aim of the day is to have fun with challenges, games and competitions, learn more about cycling skills and maintenance and take the children on to local bike paths and trails. It promises to be a fun filled action packed day. Until next time cycle safely and most of all enjoy it. Laters!!! A wheely good evening to you all and I hope you are well and enjoying your bikes as much as me! This is a very short blog to give you information about a recent interview I did for local radio. 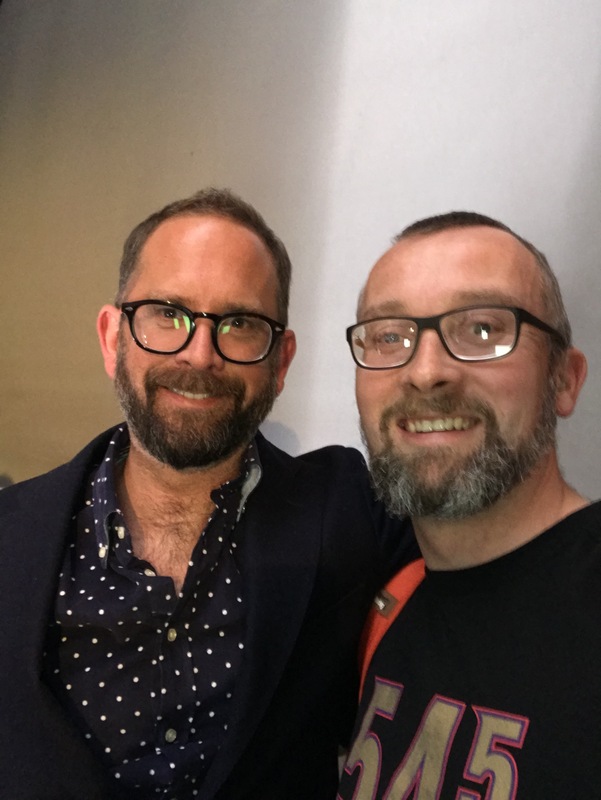 Jo Garton who I have know for many years asked me to go on to Swindon105.5 FM to talk about my cycling business and my work in the local schools. Obviously I was delighted and didn’t hesitate to say yes. What followed was a fun interview allowing me to share the work I am doing in the schools in Swindon and the local area. Please click the link below and have a listen and of course let me know what you think. Many thanks and until next time happy cycling. 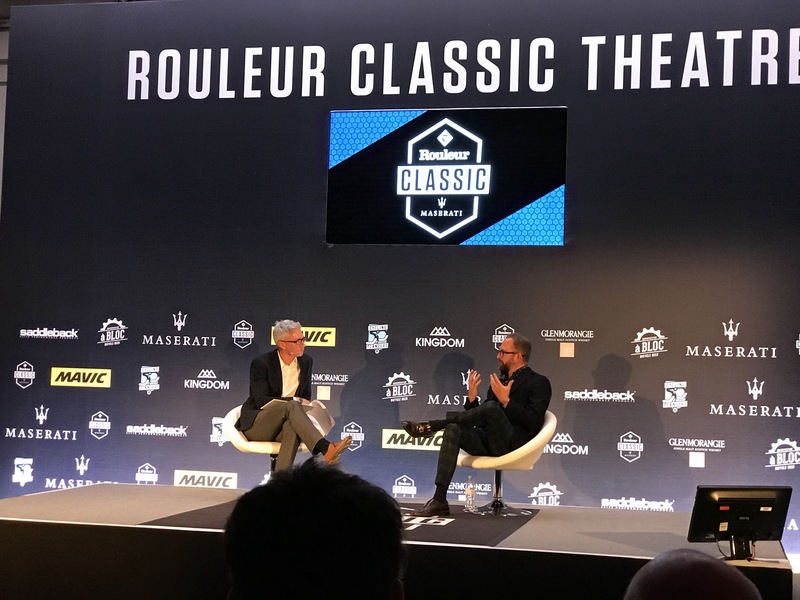 Rouleur Classic 2017 – What a night!!! So a wheely good welcome to you all and I write this on the late night train back from London having just been to the 2017 Rouleur Classic in London with my good friend Karl and his dad Roger. This is our third time on the trot and we enjoy more each year. 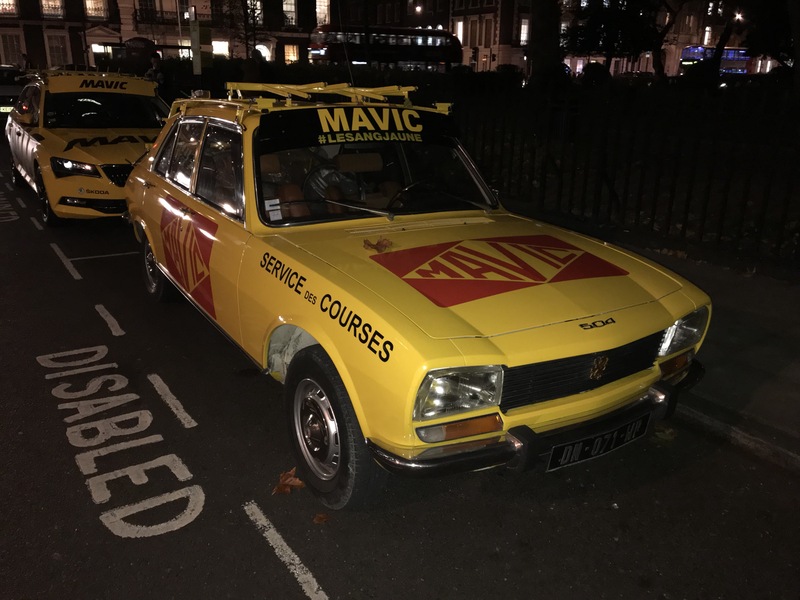 Once again the venue was the amazing Victoria House and yet again Rouleur didn’t fail in putting on a superb night surpassing previously visited years with oozing amounts of quality, memorabilia and stars of the cycling world. 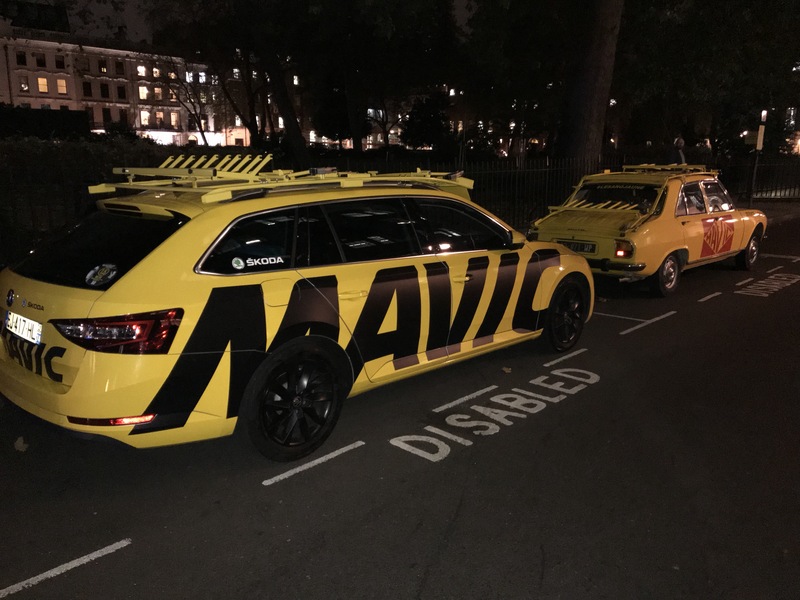 From the Mavic service course cars parked up outside I knew this was gonna be a treat. Entitled Monuments it was to celebrate the great riders who had conquered on the cobbles and roads of Flanders and Roubaix. On entering the event it was awash with the creme de la creme of brands showing their products under the dazzling lights. 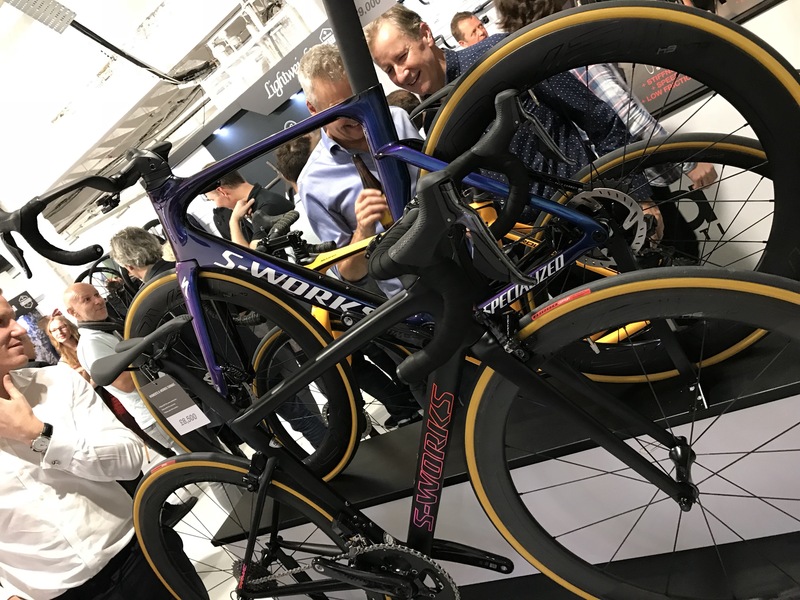 I could go on for an eternity but one that stood out for me was the s-works stand complete with the latest SL6 tarmac and some very nice custom frames. 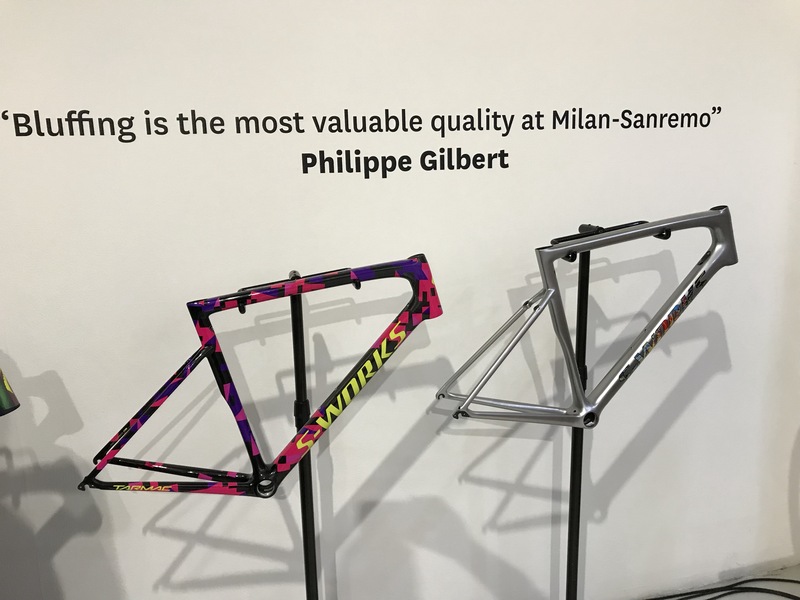 I know I am biased but s-works bikes, components and frames for me are the epiphany of top drawer bike manufacturing and I know my good friend Paul Jackson in Northern Ireland would not diasagree with me. Of course any show is not just about the products but it’s meeting the pros and people from the industry that make it all tick. 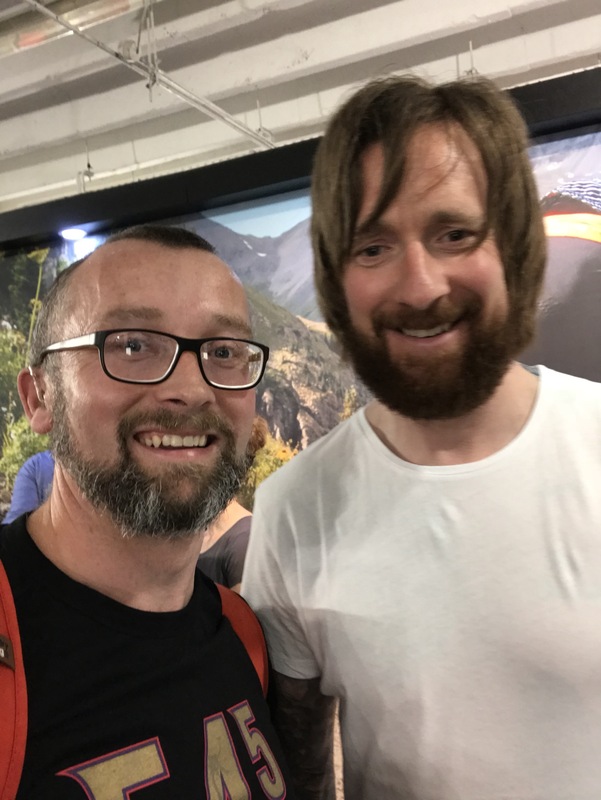 You can imagine my delight seeing Sir Bradley Wiggins once again. This guy is a legend and chatting to him about tattoos and bikes was just great. Every time I have met him over the years he’s always made time to talk and just generally be cool as he is. Of course the main stage hosted a wealth of top names. 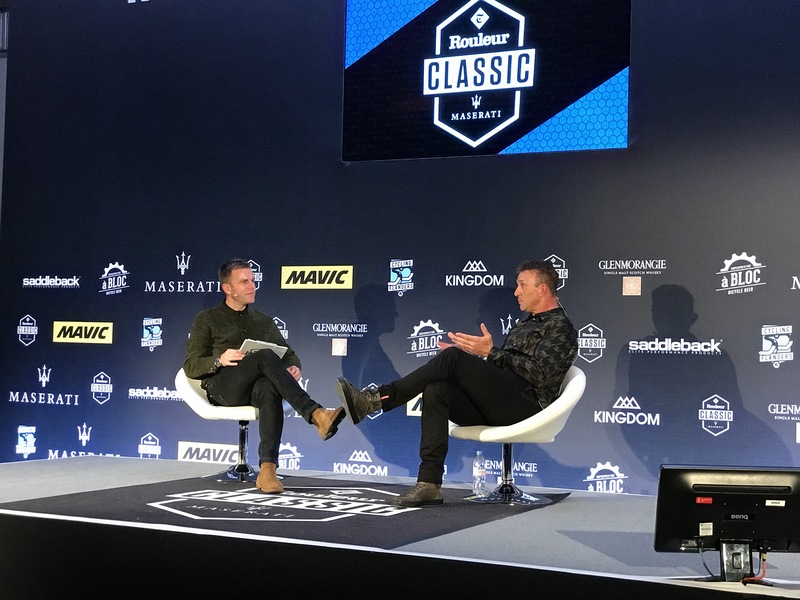 From Jonathan Vaughters talking about the new Drapac team to Johan Museeuw reminiscing on all his classics victories every guest had a story to tell and entertained the packed crowd. As the evening drew to a close all it left was one more skirt of the stands, collect our goodie bags and head off into the crisp London night air. Once again a totally amazing evening and I would recommend get a ticket for next year as rumour has it with the theme being World Champions we may see a visit from Peter Sagan, now that would be special. Just leaves me to say thanks for reading and subscribing and please check out my twitter and Instagram. Until next time happy riding and laters! A wheely good welcome from Paul Ashman Cycling. I’m sat writing this on a London Underground tube journey and just thinking how can people live and commute like this all the time. It’s hot, packed and seems so stressful all the time. Give me my bike, the freedom and the fresh air any-day. Things are continuing to pick up at PAC with the possibility of taking on a new assistant to meet the demand. One area that he will help with is a trials/bike stunts club. Teaching young students how to do this in a safe and proper way and even create the next Danny McAskill. Who knows?!? Just last week we had the Recyles RCC Tourist Trophy which tied in with the clubs second birthday. We had a great turnout for what was a fun packed day. I can’t believe it was two years ago myself and Simon formed the club and it has grown from strength to strength. The day involved a hill climb, a free wheel descent, a speed test and guess the weight of the bike competition. It was a great fun day and Simon came out the winner with me a close second. The hill climb let me down so a little more weight needed to trim off I think to keep me sprightly up those hills lol!! A big thanks to Denis for planning the event. So last week the route for the 2018 Tour de France was announced and crikey what a brilliant route they have put together. Individual and team time trials, cobbles as well as the Alps and Pyrenees shows a challenging and very entertaining route. I will be heading out to the Vendee region for the opening three stages which I am really looking forward to. This edition also sees the first time that teams will have only eight riders, will it deter Team Sky…..no chance. Froomey all the way for his fifth title I think. 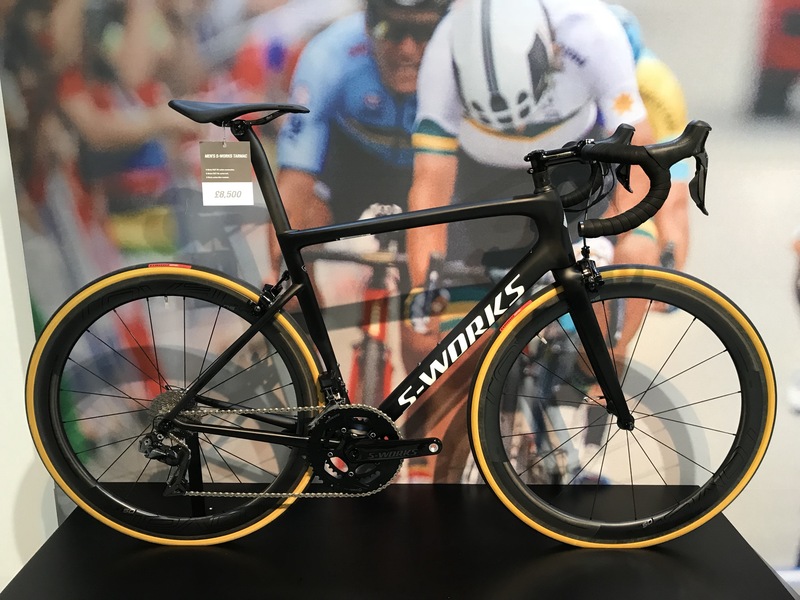 Finally I must just mention my dream s-works build. Those of you who follow my instagram or facebook will have seen the developments and now it is ready to be built. This bike will be fully kitted with Dura Ace and S-Works components and the final build should tip the scales sub 7kg. Please check out my instagram or facebook and follow to see finished pictures once all completed. That’s all for now folks so until next time enjoy your bikes and riding. I’ll be back after the weekend with a report from this Sundays Surrey cycle show I am attending. Laters!!! So a wheely good morning to you all and I hope you are all well and enjoying the lovely Autumn weather we are currently experiencing. 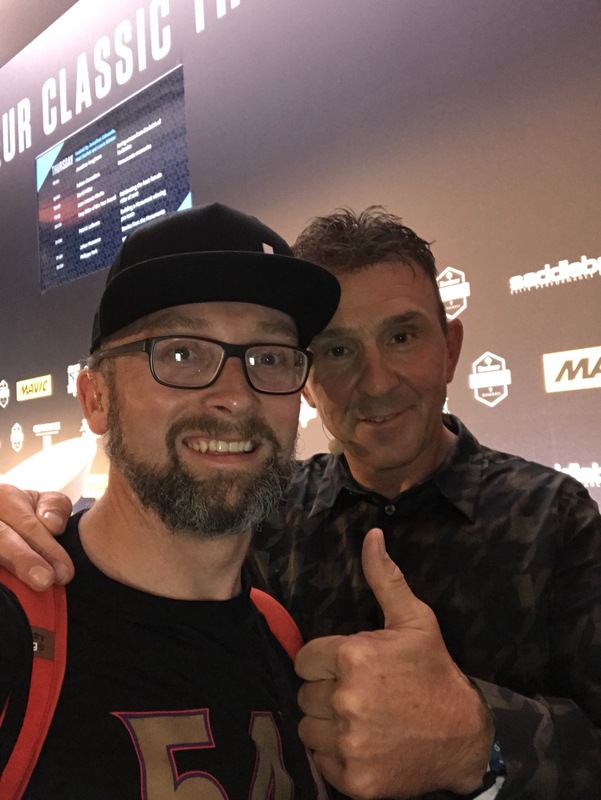 Its been a couple of weeks since my last blog and I thought it would be good to touch base on whats going on in the world of Paul Ashman cycling. The term has started in a rather manic busy way but all is good and great to be out there working with so many individuals on their bikes. I have started new projects in four primary schools on a weekly basis helping teach children everything from bike safety and handling through to the history of cycling and much much more through my 35 week course I have devised. The children turn up every week with their bikes and are loving the fun sessions we are running. Alongside this I have started three after school and one lunchtime club in schools. These run much the same way as the structured programme but with more emphasis on out on the bikes with a practical element. For more older students I have started running an after school club in a secondary school as well as a cycling club in a sixth form college. The college club has a high calibre of riders and we have been out on some great training rides already this term. The plan with this club is to enter some sportives, races and take a trip abroad next year. With more new projects on the horizon it is all looking good and boding well for the future. On a personal level my riding is going well and I have managed to keep up the training regularly. Just this weekend gone I raced in the Richard Kell memorial race in the cat 3/4 section which was a great race. Not until the last few laps did the peloton split probably due to the wind whipping across the circuit. I will be back there in two weeks for the final race of the series and then the week after I am racing at the Mountbatten centre in Portsmouth. In terms of the pros most will be on their well earned end of season holidays and with the World tour drawing to a close attention turns to the cyclocross season. Roll on next year with the new season seeing some new riders with new teams. I am looking forward to some trips next year including The Tour, Paris – Roubaix, Tour de Yorkshire, Gent Wevelgelm and maybe a couple others thrown in the mix. So all that leaves me to say is happy riding and enjoy those bikes.